Were you a little groggy to start the week on Monday? I know I was. I always have a hard time adjusting to daylight saving time. I guess a 25-hour day takes a lot out of me. Although logic might tell you that the extra hour of sleep should make you more rested, it’s not always true. It can mess with your sleep/wake rhythm and create some problems that could affect your level of energy while you’re adjusting to a new schedule. In fact, even worse than fatigue, research indicates that the incidence of heart attacks tends to increase for several days after we spring forward or, as it was in this case, fall back. So the best way to stay in good health is to set a schedule and get back on track following daylight saving time changes. To fight grogginess, make sure you get up when your alarm goes off and open up your windows. Eat breakfast in a naturally lit space to tell your body it’s daytime. It will respond naturally, and your circadian rhythm will gradually begin to get back on track. Next, follow your day as normal. As you enter the evening and the sun goes down, remind your body it should be shutting down, too. Dim the lights and avoid bright, artificial lights—this means it’s time to turn off the television and other screens, like your tablet or smartphone, about an hour or so before bed. Try to relax by reading or even taking a warm bath. Your body will respond by gradually becoming sleepy and ready for rest. Getting a good night’s sleep is important because your body needs it. Every lost hour needs to be made up, so if you lose 10 hours during the week, you should really try to make it up over the next week. It’s really like repaying a debt. But while you can try to get three to four extra hours of sleep each day on the weekend, I’d recommend fitting in an extra hour of sleep for a few days the following week instead. This will help your body keep closer to its learned schedule and your sleep/wake rhythm more on track. However, you really should make an effort to get a decent amount of sleep each and every night, rather than making a habit out of getting less sleep during the week and pressing the snooze button a few extra times over the weekend. Sufficient and consistent sleep is the best way to stay well rested and feeling healthy. 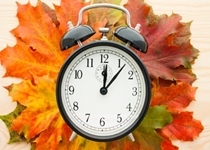 University of Alabama at Birmingham, “Heart attacks rise following daylight saving time,” ScienceDaily web site, March 7, 2012; http://www.sciencedaily.com/releases/2012/03/120307162555.htm, last accessed November 3, 2014. “Repaying your sleep debt,” Harvard Women’s Health Watch web site, July 2007; http://www.health.harvard.edu/newsweek/Repaying-your-sleep-debt.htm, last accessed November 2, 2014. Painter, K., “When time shifts, remember your body has a clock, too,” USA Today, November 2, 2014; http://www.usatoday.com/story/news/nation/2014/11/02/reset-body-clock-standard-time/18024483/.